Have I mentioned before that I love cooking magazines? I do. Every month I get Cooking Light, Taste of Home, Bon Appetit, Vegetarian Times, Saveur, and Cooking delivered to my door. That’s in addition to magazines I pick up when I’m standing in line at the grocery store. I can’t help it, I love beautiful photographs of food and amazing recipes. When I first get a cooking magazine I flip through the pages to see if any of the pictures catch my eye. If they do I take a look at the recipe and decide if it’s something I want to make. Then I toss the magazine in my magazine basket to look at on the weekend. 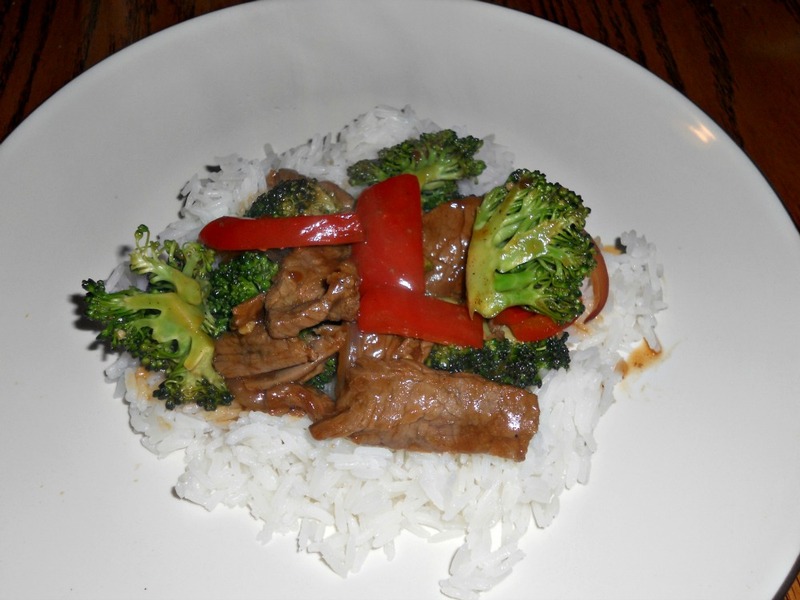 This month when I opened up my Cooking Light my eyes immediately fell on the Beef and Broccoli Bowl. The funny thing is, I wouldn’t have guessed that’s what it was from the picture. In the picture the food is on a white plate. There is brown beef, green broccoli, and orange carrots. The colors are beautiful and vibrant. 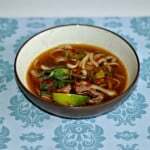 I changed the recipe just a bit when I made it the very next night. I switched out the carrots for a bright red pepper. I also added in some garlic. Frank and I both ended up really enjoying this dish. It was bright, colorful, and had a nice flavor to it as well. It wasn’t full of soy sauce as so many Asian recipes are. There was some soy sauce but there was also hoisin, sesame oil, and seasoning. I found it to be light but filling. 1. 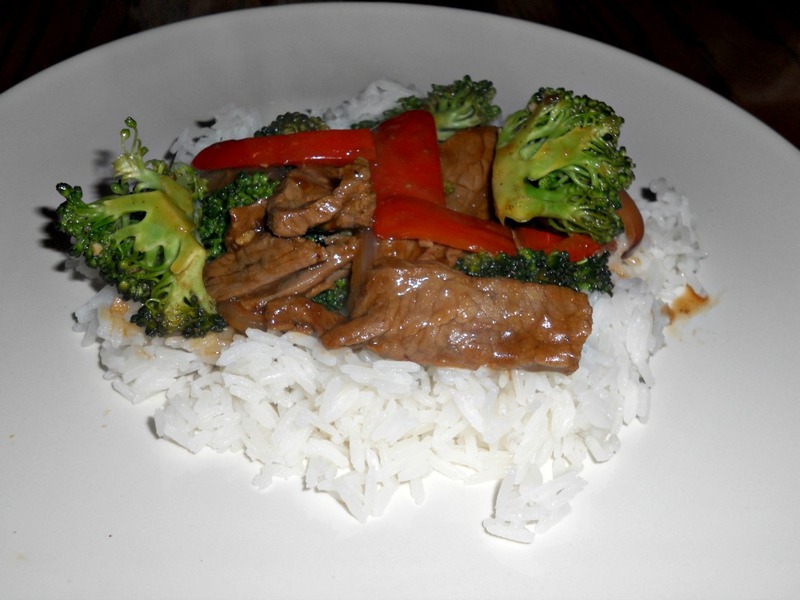 In a medium bowl combine the soy sauce, cornstarch, and hoisin. Mix well and add the strips of beef. Toss to coat. 2. Heat a large skillet over medium high heat. Add the vegetable oil to the pan and swirl to coat. 3. 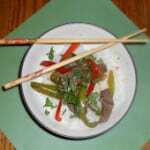 Remove the beef from the marinade and add to the pan (reserve marinade for later). Cook for 3-5 minutes or until the beef has just browned. Remove from the pan and place in a bowl. 4. 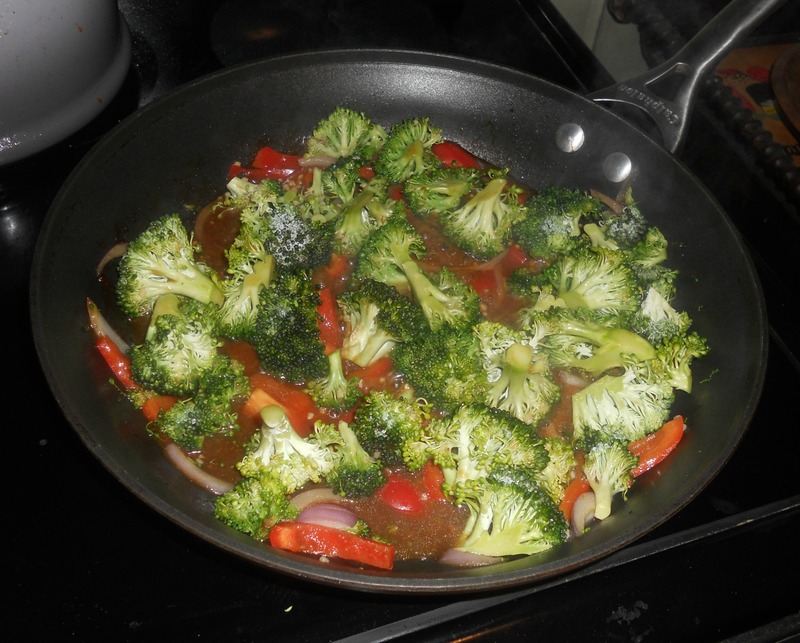 In the same skillet add the garlic, broccoli, onion, red pepper, water, and sesame oil. 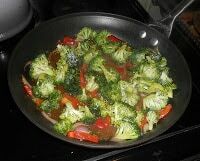 Cook for 5 minutes or until the broccoli is just becoming tender. Add the reserved marinade to the pan and bring to a boil. Cook for 1 minute. 5. 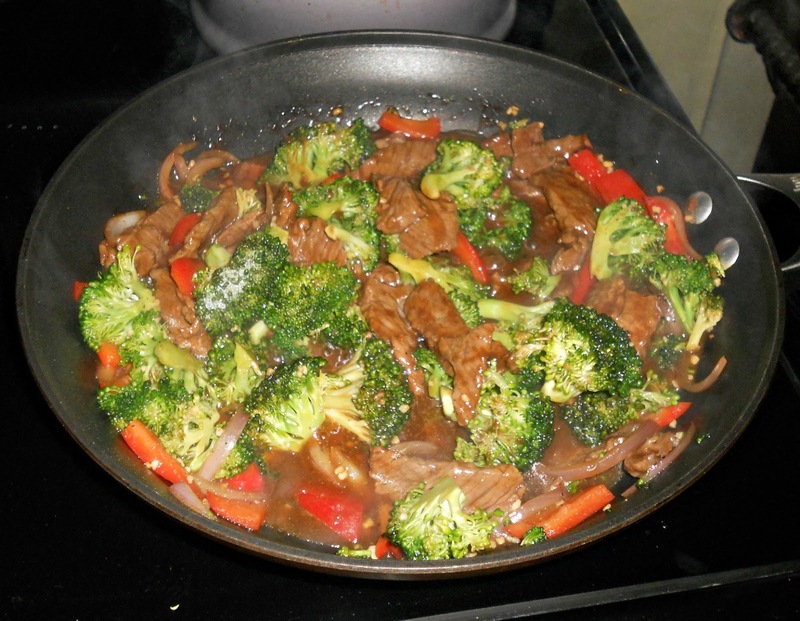 Return the beef and any collected juices to the pan. Cook for an additional minute. 6. Serve over top of jasmine rice and sprinkle with green onions. What a great bowl of flavor, this will be awesome! Hope you are having a great weekend and thank you so much for sharing with Full Plate Thursday.